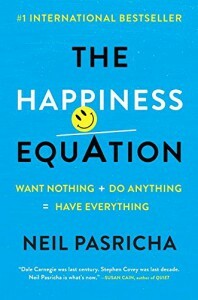 The Happiness equation is a book full of life lessons from , Neil Pasricha , the writer and how he shaped his life by just a simple equation. This book has opened my understanding of the word happiness. Happiness have different meanings in different contexts but in this book all is classified into the state of being happy. Each chapter elaborating on different points that make up this equation . The most valuable lesson for me personally that I myself had previously overlooked in my life was how decision making on the little and unnecessary things in life was draining your productivity level . Reading it at first sight was hard for me to believe as I was always a firm believer on changing my decisions based on my mood on the day itself . But little do I know it really had a big impact on my life as I was always contemplating on the decisions I did not make . For example the writer himself stated that when he was trying to see the fault on the decisions he had to make everyday he wrote down all of them and upon reading them he was amazed that he made 285 unnecessary decisions a day that was slowly exhausting his brain. Another valuable lesson that this book has taught me was to always be yourself . When you do not be true to yourself you are just casting all those energy in you just to maintain the second identity you have that is put on show every time you are in public or with anyone else . This is true as when you meet someone for the first ever time you and the person are just meeting a representative of each other , when your friendship prolongs the representative of the person you have meet will slowly disappear when one feels comfortable with someone . Being yourself at all times also prevents you from making a big regret on the final day of your life as a nurse once wrote on the Daily mail a blog post on the 5 greatest regrets of the dying , and what do all of them have in common? All of them were having the biggest regret of their lives just because their whole life was catered to this other self of them . Overall this book has really made me more conscious of how I am living my life as a whole . Following the happiness equation is my main goal as the stories of how it has benefited lots of live has inspired me to take action to dedicate myself to the happiness equation. I strongly recommend this book too anyone who just needs an overview of life and to anyone who are interested in learning the secrets of how even the top entrepreneurs are living their life with no regrets despite their constant need of being there for their work .